Welcome to Week 38 of Year 5 here at Paint Party Friday. Happy belated Thanksgiving to all our American PPFers!! We are ever thankful to have such a wonderful group of painters and partyers join us each week! Thank you!! LOL - Random.org did it again - choosing #52 - Wanda who painted a very festive still life that is so appropriate for this season! As always, please make sure to use your post URL address NOT your blog home page URL address as there are many late visitors who get confused as to which post is for PPF when they arrive (after Friday) at your website. If you are unfamiliar with Mr. Linky, an explanation of how this tool works can be found on Week 1 and Week 2 posts. Have a week full of love and creativity! Welcome to Paint Party Friday Week 37, Year 5... We are so glad you're here! This week the random.org number generator chose #52 Carol Samsel. 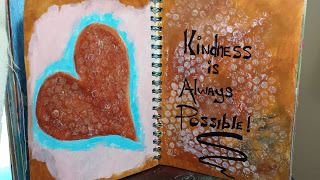 Last week Carol shared a journal page that she had painted a while back, but just added some quick inspiring words to... Proof that even a little art time can have a big impact! Please stop by her blog to see all of the other goodness she had to share. We would also like to spotlight another PPF artist this week who created a beautiful Paris tribute: Pauline Leger. 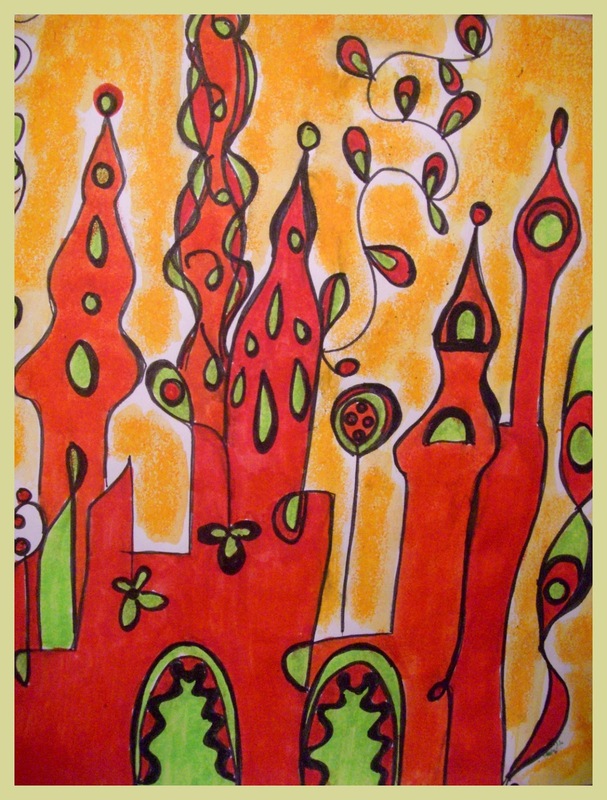 In addition to her beautiful Eiffel tower drawing, Pauline also shared some written inspiration, so please be sure to stop by her blog. As always, please make sure to use your post URL address NOT your blog home page URL address as there are many late visitors who get confused as to which post is for PPF when they arrive (after Friday) at your website. If you are unfamiliar with Mr. Linky, an explanation of how this tool works can be found on Week 1 and Week 2 posts. Wishing you a paint and peace filled week. Welcome to Week 36 of Year 5 here at Paint Party Friday! Have a inspired paint-filled week! *little note from EVA - I am off to warm climes next week and am looking very forward to going diving, snorkelling and communing with the fishies. The synchronicity of Random.org's choices continues to amazes me! Welcome to Week 35 of Year 5 here at PPF! This week our random number generator chose #27 - Dreamcolor Kat. 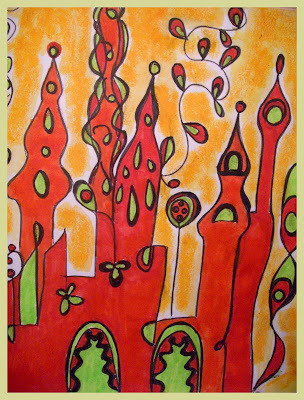 Fanciful places and architecture captured Kat's imagination this week as showm by her vibrant paintings of Castles (see below) and a streetscape (please see her blog post) of a little town.